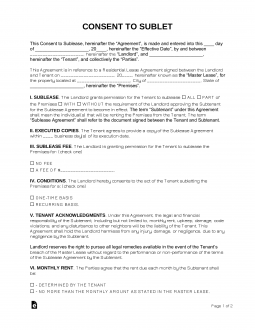 The Sublease consent form allows a tenant that is subject to a lease, that forbids subletting, to allow them to rent the property to another individual. Even though the tenant will be fully responsible for any sub-lessee that is brought into the premises, the landlord can make requirements, for example, that all sub-lessees must be approved by the landlord. In most cases, this is a last resort by the tenant if they no longer want to be on the lease and the landlord is unwilling to allow the tenant to break themselves from it. Sublease Agreement – Use after consent has been granted to create a binding contract between the tenant on the property and the sub-lessee. Each of the buttons on this page will link to this document as a specific file type. Thus, by selecting one of these buttons you may access this template as an Adobe PDF, Microsoft Word (.docx) or Open Document Text (.odt) file. Several articles in this consent will require direct attention. Article “I. Sublease” shall provide two checkbox choices. The first, after the words “…For The Tenant To Sublease,” seeks to define how much of the premises the Landlord will allow the Tenant to sublease to another party. Mark the first check box if the Tenant may sublease the entire premises or the second checkbox to indicate the Landlord will only allow part of the premises to be sublet. Next, we will need to indicate if each Subtenant must be approved by the Landlord or not. If so, then mark the checkbox labeled “With.” If the Landlord does not require the Tenant to gain Landlord approval for each Subtenant, then mark the checkbox labeled “Without.” Use Article “II. Executed Copies,” to note when a copy of the Sublease should be provided to the Landlord. Enter the number of days before the Sublease’s Execution Date when such a copy must be furnished to the Landlord on the blank line between the words “…Copy Of The Sublease Agreement Within” and “Business Day(s) Of Its Execution Date.” Article “III. Sublease Fee” will document any expectation the Landlord has of payment for the consideration of allowing the Tenant to Sublease. If he or she will not charge the Tenant a Sublease Fee, then mark the check box labeled “No Fee.” If the Landlord does intend to collect a Sublease Fee from the Tenant then, mark the check box labeled “A Fee Of” and report the expected Sublease Fee (in USD) on the blank line provided in this article. The final part of this document will provide two defined areas after its articles where the Landlord and his or her Tenant may formally provide proof of their acknowledgment. The Landlord must sign the “Landlord’s Signature” line and print his or her Name on the “Print Name.” This should be followed by the Landlord’s Signature Date recorded on the “Date” line. The Tenant who seeks approval will also need to sign this document. He or she must sign the “Tenant’s Signature” line and record the Date at the time of signing on the blank space labeled “Date.” Additionally, the Tenant must make sure to present his or her Printed Name on the “Print Name” line.